The Morrigu is a Clan main battle tank released in version 0.4.0. It focuses primarily on heavy long-range energy weapons. It possesses a limited field of view and suffers from poor maneuverability, which can make piloting over rough terrain a challenge. Nonetheless, its potent armament and massive amounts of armor makes it a force to be reckoned with on the battlefield. All the Morrigus variants mount the same type of electronics package as well for plenty of protection against missiles and the ability to pick targets from range while remaining undetected thanks to its GECM. The Morrigu is also unique as it is the only tank that carries dual LAMS which give it a much needed umbrella against enemy missile barrages, and outside of most Riflemans select Daishi and Atlas variants, the only asset in the game with such a setup. This protection will also extend out to friendly nearby teammates. The Prime variant of the Morrigu is a potent long-range fire support vehicle. 3 CERLBLs and 2 CLRM15s provide ample firepower against slower-moving targets while 2 LAMS units keep it and nearby friendlies safe from enemy missile barrages. It's key feature is to hit far hard where it hurts the most - a selling points most other of its brethren revolve around as well. Trading down for 3 CLPLs and 2 CSRM2s, this variant has the fastest fire rate out of any other Morrigu and is very well suited to keeping constant fire on all kinds of targets. Once its target is within 850m, the tank can unleash its rapid fire arsenal of 3 CLPLs which can make short work out of any lightly armored unit as long as the driver keeps the beam steady. Firing from complete radar concealment due to its GECM, enemies are often surprised by the first pinpoint precise shots heavily damaging critical components. Follow up shots are literally continual as the 20 HS can easily deal with the generated heat. The backup CSRM2 are at best a deterrent to battlearmor and add some extra enemy screenshake. Keep your radar off, the range open and stick with more maneuverable friendly assets to avoid getting swarmed by opponents. Known as the "Scalpel" and mounting only 2 HLLs and a HAG20 as armament, this variant packs an impressive punch at up to 600 meters. Alpha Strikes, while extremely powerful, are generally ill-advised due to sudden and extreme heat buildup. The 17 HS are not fully able to keep heat at bay; chainfiring the heavy lasers enables the B to maintain a tremendous stream of hurt and dismay without the danger of melting itself. The "Mjolnir" variant definitely packs more burst damage with the triple CERPPCs than the prime but has downgraded twin CLRM5s mounted instead of 15s. They do the job of harassing enemies and can soften them up while the CERPPCs are recharging. Heat can be a issue on this variant so chainfiring is required as firing all three cannons simultaneously, they will instantly damage the tank. As this Morrigu has no close range weaponry, it heavily relies on teammates keeping it safe from being overwhelmed. This Morrigu is the cheapest of the bunch, and brings respectable firepower in the form of a trio of CUAC10s, backed by a pair of CSSRM2 launchers. It is quite capable of standing toe-to-toe with similarly-priced 'Mechs and beating them into scrap with sheer brute force. Like all Morrigus, the D packs GECM to maintain concealment on the battlefield, which is absolutely essential for the D given its maximum range bracket of 600m, but lack optics and LAMS of its brethren. The D also burns through ammo quickly and being a slow asset, returning to base for reloads is a tedious process. Game tip: keep an eye on nearby friendly APCs, and replenish the ammo there, instead in the remote base. A more medium-ranged focused twist on the D, the Morrigu E's firepower is based around its dual ATM9 array, with the three CUAC5s providing consistent damage over time. The E can suppress a hostile target by chainfiring the missiles and using the autocannons to carefully pick a hole in their armor. This version works best as a fire support, battering the most dangerous enemy in a fight while swatting hostile missiles with the dual LAMS. Five free tons of extra space give it good staying power in extended conflicts. 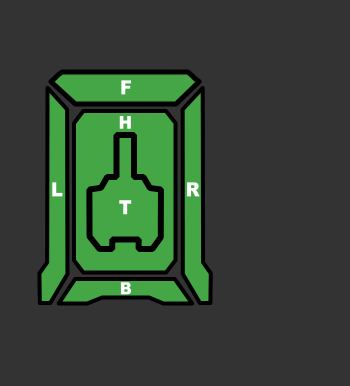 Although its loadout can be dangerous to aerospace fighters and VTOLs, the Morrigu's restricted field of view can make spotting air assets challenging, along with its maximum turret pitch of only 45 degrees. 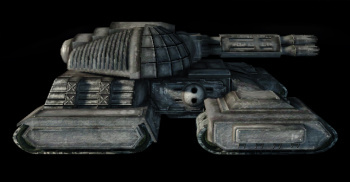 The Morrígú was designed as an 80 ton fire support tank by Clan Blood Spirit after the Absorption War on the order of Khan Karianna Schmitt. Its main purpose is to deliver as much damage from as long a range as possible. Being in each Clan Blood Spirit Galaxy, Morrígú Tanks can be found in ranks of Fire Mandrill as well. The Morrígú is armed with 2 ERLBLs and 2 LRM15s for long-range fire support, 2 SRM2 for close-range defense, and a GECM for additional protection. An alternate variant has only 3 ERLBLs, at the cost of all of its missile launchers, and 2 of its 13 tons of armor. Its namesake is a Celtic goddess of war. This page was last edited on 13 February 2019, at 16:22.